That’s why City Connects Coordinators are so important. They get to know their schools, and they build relationships that help students learn, and that help families thrive. From the whole class reviews to casual chats in the hallway, coordinators are always connecting. They get to know every child and work together with teachers and other school staff to gather the knowledge of those who know the student best. The relationships she has built over time with students and families have helped her handle sensitive issues such as mental health needs. When trauma strikes, Silverman connects. 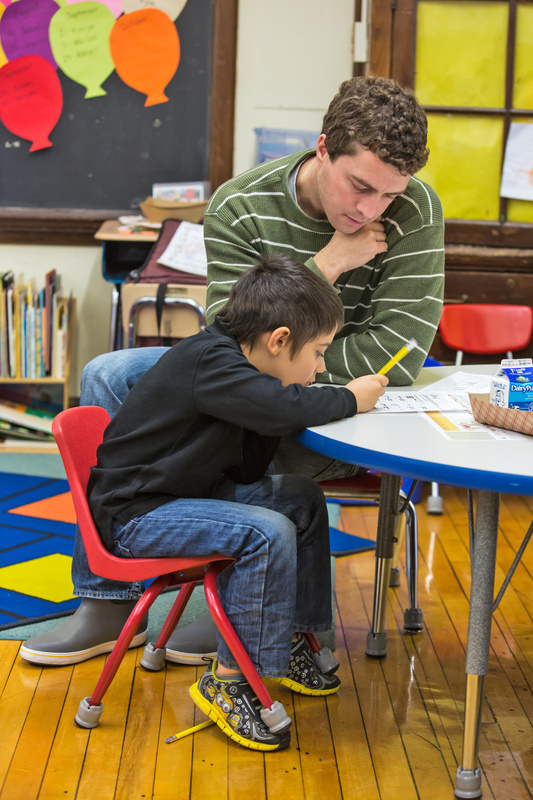 For Will Osier, being there for students in need is key. “I focus on being a consistent adult for a student. Every time a student comes to school in the morning, I’m there and I call that student by their name. I give them a high five, and make sure they know that I’m always there for them,” Osier says. He worked for four years as the coordinator at Boston’s Chittick Elementary School. Now Osier is the coordinator in Boston’s Quincy Upper School. At the Thomas A. Edison School in Boston, City Connects coordinator Abby Westcott works with a lot of English-language learners. It is important for her to develop relationships with them, help them settle in, and identify ways to facilitate their integration. “At my school, one of the most rewarding relationships I had was with a student from Cape Verde. She arrived in October, so she was about a month late arriving at school, and she did not speak at all,” Abby Westcott recalls. “As the year went on, she started to speak, and to speak a lot in Cape Verdean, and not very appropriate things were being said. In the morning, she was having a hard time sitting still and following basic directions. She would leave the building and run around. My job became taking her into my office four times a week to play. It would be seven minutes or ten minutes based on the timer, and we had a sticker chart. She got a sticker for staying in my office, pulling out a game, setting it up, and putting it away. The student’s English was coming along slowly, so Westcott couldn’t talk to her about her challenges, but Westcott did get the child settled in so that she could access the curriculum. To help students and connect them to the right set of interventions and enrichment programs, it is critical for coordinators to build relationships with teachers and school staff. Teachers spend a lot of time with students. They know them well and they are instrumental in helping identify the strengths and needs of each student. Teachers tell us that City Connects’ relationships work. Thanks to the coordinators’ work, teachers know more about their students’ lives and more about the many services and enrichment opportunities that are available to support families. “City Connects is a bridge that connects home to school [and] vice versa. You have a better understanding of students’ needs and support to better serve your students and families in their community,” explained one Ohio public school teacher. Research has found that in City Connects’ schools, students’ do better. Their academic efforts increase, and their attendance and report card grades improve. Studies of students who received City Connects support in elementary school find that when they get to middle school, they significantly outperform their peers on standardized tests, and they are narrowing achievement gaps. Throughout their school years, students are less likely to be held back a grade, to be chronically absent, or to drop out of high school. In other words, relationships matter because they help students thrive.